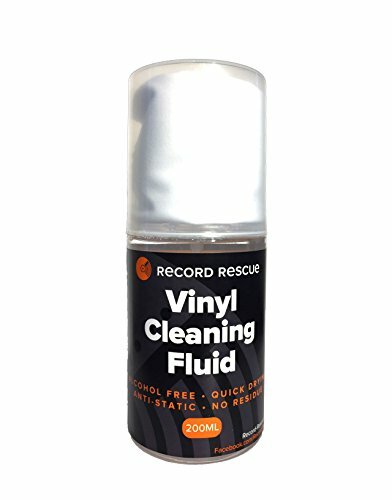 Introducing Vinyl Cleaning Fluid by Record Rescue, the highest quality record washing solution imaginable. Let's face it, vinyl is perfect. Your favorite LP perfectly preserved into each and every microgroove... It's enough to make you want to do something crazy, like buy a cassette or something. Yet, eventually your records are going to collect a little dust. That's where we come in. Here at Record Rescue, your tunes are our top priority. We've dedicated years to developing best in class record cleaning accessories. Our Vinyl Cleaning Fluid is made with top quality ingredients, which means your records will maintain their integrity while being restored to their original sound quality. Our cleaning solution spray is alcohol free, anti-static, quick drying and residue free. An 8x8 Microfiber Towel is included which can be used to help in the drying and cleaning process. We guarantee a more enjoyable listening experience and a difference you can really hear. Our Vinyl Cleaning Fluid makes a great gift for the record collectors or audiophiles in your life! Place a microfiber cloth or slip mat on a flat dry surface (Note: you may use your turntable for this step, but please use caution). Apply 6-10 pumps of fluid evenly to record and let sit for 1 minute to allow the cleaner to soak into the microgrooves. Using a clean microfiber cloth or cleaning pad, gently wipe in a counterclockwise motion for 3-5 rotations or until dry. Repeat steps 2 and 3 if necessary. All done! Set your clean record aside and all it completely dry. If you have any questions about this product by Record Rescue, contact us by completing and submitting the form below. If you are looking for a specif part number, please include it with your message. JFJ Disc Repair White Buffing Pad for JFJ Double Arm Machine.